It all began one day with me being a couch potato, a dud spud surfing the channels. Bored of home shopping TV and infomercials, I turned to my Tivo, and noticed that I had managed to acquire a few more episodes of Alton Brown’s “Good Eats”. I watched the episode a couple of times, and I was intrigued. It had several techniques and ingredients I had never tried before. Were those ingredients absolutely necessary? Could it be adapted to a Dutch oven? I called my expert sister and asked for a second opinion. She confirmed that, yes, in order to make a really good paella, you really did need special rice, and good Spanish saffron (the expensive stuff). She was skeptical about doing it in a pan that was not a paella, however. I decided to give it a try, anyway. I spent two weeks acquiring all of the various ingredients, rewatching the show, and planning my processes. In the end, it was well worth the effort! As I shopped around for the ingredients, I watched closely. Alton and my sister both recommended Valencia rice. I ended up finding a short grain Italian rice called Arborigo. Getting the saffron was trickier. I shopped around and called stores, and found something in a store near me labeled “Spanish Saffron”. It seemed to meet all of the criteria that I’d been told, and cost about the same as what I’d been seeing in spice specialty shops, so I bought it. It was about $18 for a gram or two. Pricey stuff. On cooking day, the first step was to get some coals ready. One bunch of them went under my 12” Dutch oven, and another set went under my 8”. In the 8”, I put three frozen blocks of my own homemade chicken stock. Six cups. In the end I didn’t need it all, but It was good to have it all there and ready. I put it on the coals so it would melt and heat up. It won’t need to be used for quite a while, so if you’re working with boxed or bottled stock, you can probably start heating it up much later in the process. The 12” got a little bit of olive oil. Once it was heated I put in the chicken thighs, skin side down, to fry and brown. A lot of fat renders out of the the skin. That’s used as part of the the dish along the way. While the chicken was cooking, I diced up the peppers, minced the garlic, and snapped the beans. I thought about dicing an onion, too, but in the end decided not to. I’m not sure why. It wasn’t in the original recipe. I also mixed the rice and the other dry seasonings in a bowl. The tomato was done with interesting process, taught by Alton. You want the tomato flavor, but without the seeds or the skin. I sliced the tomato “across the equator” and squeezed out the seeds. I got kind of lucky, as the tomatoes that I had bought were pretty large and pulp-y. Then, I put the open face of the tomato against my cheese grater and grated the pulp and the juice into a bowl. The more I grated, the flatter the skin became, and so I got more and more pulp. Clever. If you don’t want to do this, you could probably just use a smaller can of crushed or diced tomatoes. 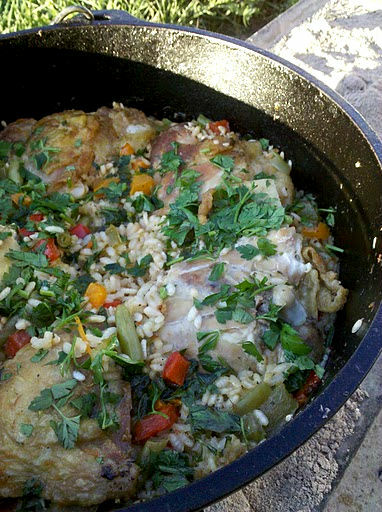 When the chicken was brown on both sides, I pulled it out of the dutch oven. I tossed in the veggies, and sprinkled in some salt. Once the veggies were going soft, I added the tomato pulp, and let that cook for a bit. Finally, the rice mix was stirred into the pot. I also used this opportunity to replenish my coals. At that point, it was time to put it all together and do the final cooking. I put the chicken back in, nestling it down into the rice and veggie mixture. I ladled the simmering stock from the 8” oven into the 12” oven, until the rice was well covered. I let that cook, with the lid off, watching occasionally as it went. About every ten to fifteen minutes or so, I would see that much of the liquid had been absorbed into the cooking rice, and I would ladle in a bit more stock. I was watching to see the rice become translucent. Occasionally, I used a spoon to check the deeper rice, and to taste. I was careful as I added more stock, because I wanted enough for the rice to absorb, but not so much for it to end up like a soup, or even a thick stew. I could see why it was important to have the stock pre-heated on the side, so I wasn’t shocking it with cool an having to heat it all back up to continue with the cooking. As the end of the cooking time approached, I squeezed the lemon juice over the whole dish, and sprinkled on fresh chopped parsley. Finally, when the rice was translucent and soft, it came off the coals. I don’t know how long it took to get there, as I was paying more attention to the rice than the time. The last step was to let it rest with a kitchen towel on top. I’m not sure why it couldn’t be covered with the dutch oven lid. Perhaps the final resting time needs to be done with something porous on top, so some moisture can escape. The final texture is moist and soft, but not dripping with juice. After about 15 to 20 minutes in the rest phase (it could be even longer, if you want), it was time to serve it up. 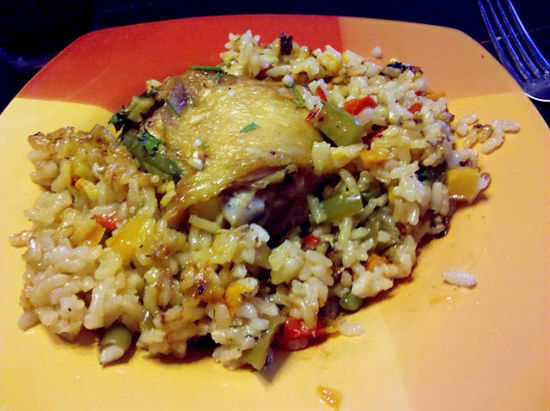 Since this was my first time making it, I didn’t know how great paella was supposed to taste. I think I did, but I’m not certain if I got the right rice or the right saffron. Still, what I was eating was one of the most delicious meals I’d had in a long time. I guess that qualifies it as a success. sounds fantastic !! thanks for posting. Very interesting. I saw a bobby flay paella show about a year ago and it looked awesome. I might combine your info with his ingredients and see what happens. Thanks for posting!